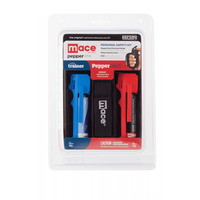 Home >> CLEARANCE/Closeouts/Discounts >> Expired Pepper Shot Pepper Spray 2 oz, 4 oz, or half oz keychain. These items are past their due date. Until Supplies Run Out. No Returns. 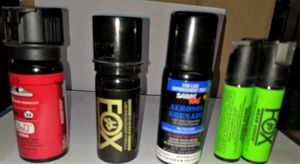 These pepper spray are way past their expiration, but have been stored at room temperature and were in wrapped/sealed packaging. They may be 2 or 3 years past their due date. Use for practice. The formula does not degrade, it is always hot and effective, just the ability to spray deteriorates. No returns. Remember, Fox labs has the Manufactured date printed on the can, add 3 years for the technical expiration. Pepper Shot� in the convenient 2 ounce can is just right for home, office or boat or carry on your belt with the leatherette holster with belt clip available below. It is available in a stream or fogger. The extreme 2 million shu formula is devastating at a 10% solution. It also includes a UV identifying dye to mark your target for later identification. These units employ the twist lock top to minimize accidents and make hitting your target as easy and automatic as possible. 2 oz. stream has a range of 10-12 feet and 10-12 one second shots. The 2 oz. fogger has a range of 10-12 feet and 8-10 one second shots. The stream comes out like a squirt gun and the fog spray is wider with greater dispersion.